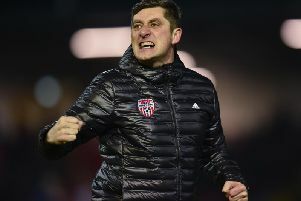 DECLAN Devine hit out at a section of the Finn Harps supporters who cheered as Derry City defender, Ciaran Coll was stretchered off the pitch at Finn Park. 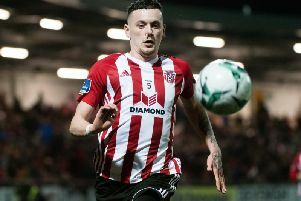 The City boss confirmed the ex-Finn Harps skipper Coll was taken to hospital with a suspected broken leg following a horrendous tackle by Deasy in the first half of Derry's 3-2 win in Ballybofey. And while Devine is hoping the injury isn't as bad as it looked, the City manager was 'disappointed' by the reaction of the Harps fans. "I thought it was horrendous," he said of the tackle. "I thought it was a really, really bad tackle. "I'm disappointed that some of the Finn Harps fans were cheering seeing a player who gave 10 years service to their football club, cheering him coming off on a stretcher was a bit poor. "Hopefully he'll be okay after visiting the hospital for treatment. I've no idea at the minute. He's at the hospital but he could potentially have a broken leg. Hopefully that's not the case. It was a really bad tackle but best wishes to Ciaran." It was a feisty affair and Devine admitted he was fearful that it could boil over at certain times. "There was a few time a few of our boys were getting involved in things they shouldn't have been getting involved in. Look, there's a lot of passion out there tonight. "It could'be swung any way but we're delighted., Our players give us everything and we're over the moon to get three points because I know a lot of teams will come here and get it very difficult this year."